"Improvisation—Thinking on Your Feet: Myth vs. Reality" by Jim Richardson, Stand-Up Comedy Coach & Co-Writer. where the questioner had only been dealing with intended and unintended heckling. "calling someone out for heckling or scolding someone being too loud in general". Instead, try pro-actively provoking the audience with questions that cannot be answered "yes" or "no." imagine yourself in the audience hearing your question. How might you answer that question with a heckle? How might they each answer your question with a heckle? You only have 1-2 set up lines/joke with the second or third sentence being your punchline. The audience does not give you any credit for improvising. In other words, the illusion your memorized and staged material creates is that you are making-it-all-up-as-you-go-along. Therefore, when you are actually making it up, . . .. Many comics think that the standards change when they improvise and therefore, add way too many set up lines. That in turn kills their laugh pattern. 1) Your question is the first set up line. 2) Their answering or heckling will either be a joke of their own or yet another set up line. or the bit will not build. That's the basic work behind Working The Crowd. Of course, there's a lot more to it than I could ever fit into one web page. Note: Flash is not allowed on Apple iOS mobile devices like iPhone, iPodTouch and iPad. "Working the crowd and Wading into the audience: taking advantage of hecklers"
"When I walk amongst them!" 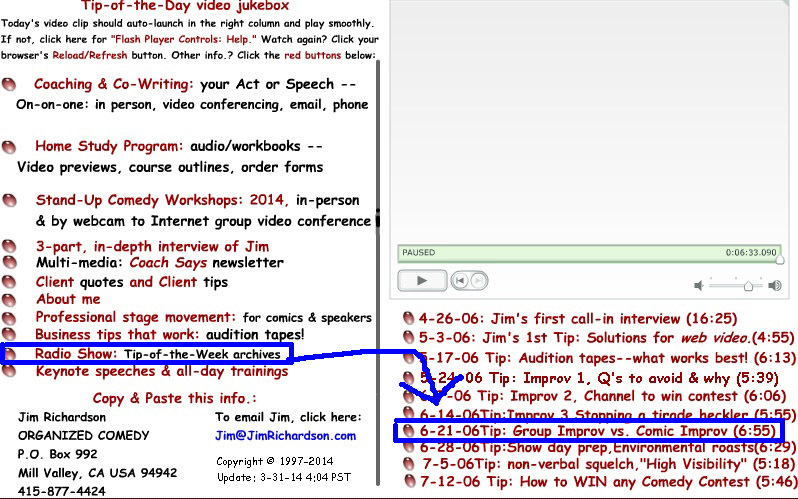 A new video tip every day will automatically launch in the right-hand column. 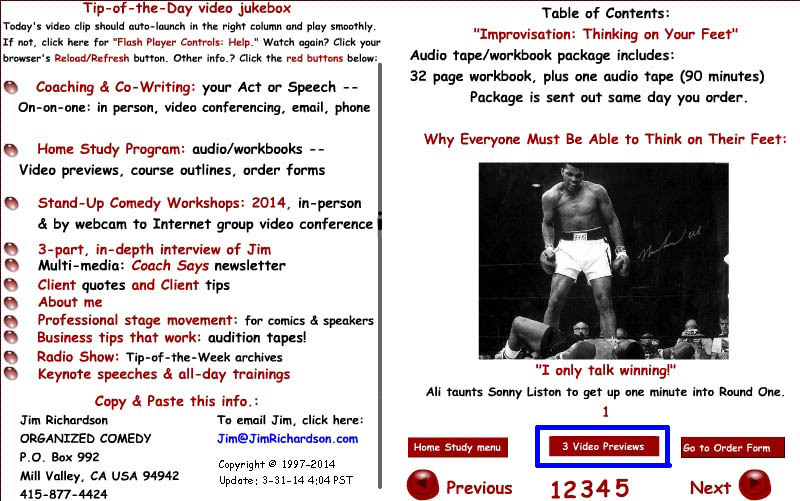 Click the link to "Home Study Program: audio/workbooks" (HSP)in the left-hand column. 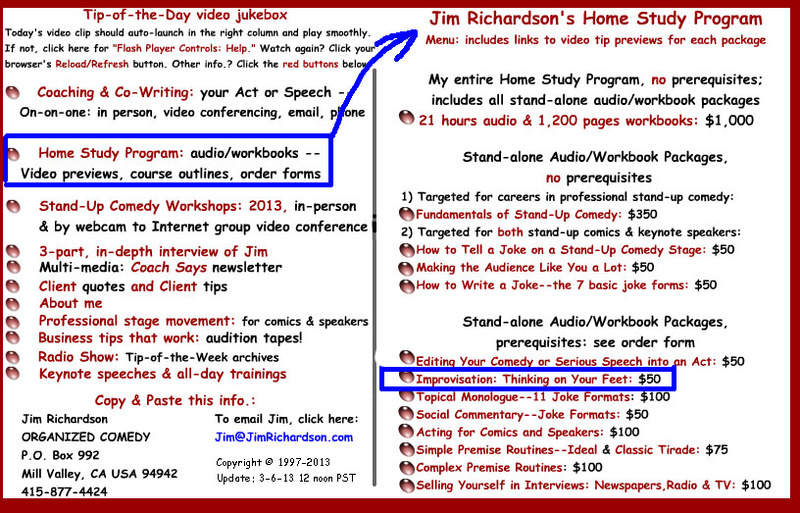 and replace that video with this "Jim Richardson's Home Study Program" menu. 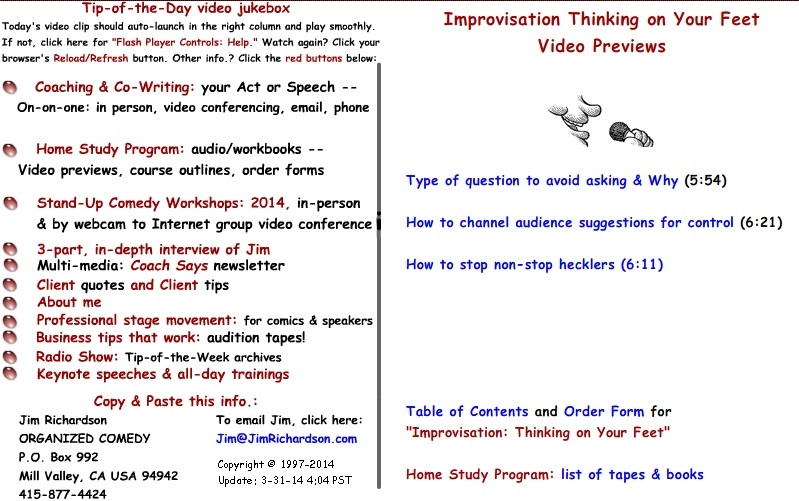 Next, click link to "Improvisation: Thinking on Your Feet." for "Improvisation: Thinking on Your Feet." That will replace current content in the right-hand column with links to "archived audio clips". See the screenshot with a blue arrow between two blue boxed links. Still want to learn more about how different comics effectively use improvisation in their performances? Note: if this sounds a little radical, it was the end of my speech and I had less than a minute to reply. Not to worry: I expand on the very next page. 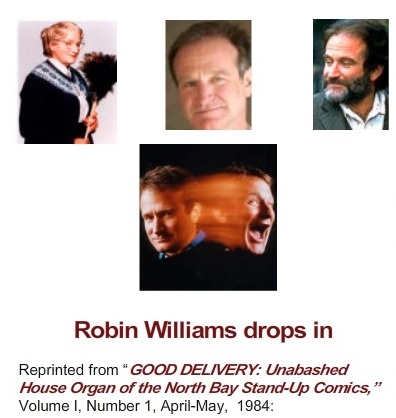 Bill Rafferty, Jim Giovanni and Robin Williams. I introduce the editorial with another video clip on page ii, "Mount Rushmore of Stand-Up Comedy" (:54). right-hand column on "Dealing with Hecklers, Roasts, Delivery, etc." Page created: Tuesday, May 13, 2014, 8:15 pm PST and updated Sunday, January 6, 2019, 10:17 pm.